(Scott Sommerdorf | The Salt Lake Tribune) A group of about 40 people protested the strikes on Syria, Sunday, April 15, 2018. 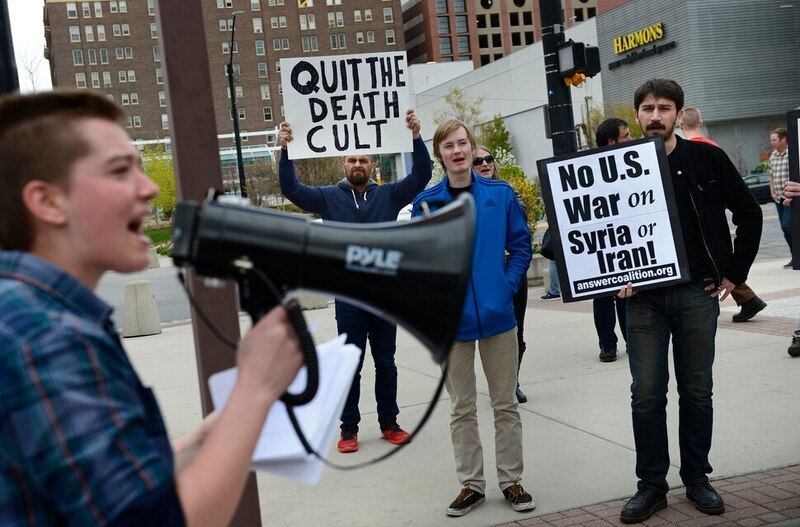 (Scott Sommerdorf | The Salt Lake Tribune) Nick Godfrey spoke on the bullhorn as a group of about 40 people protested the strikes on Syria, Sunday, April 15, 2018. (Scott Sommerdorf | The Salt Lake Tribune) Bryn Dayton speaks on the bullhorn as a group of about 40 people protested the strikes on Syria, Sunday, April 15, 2018. 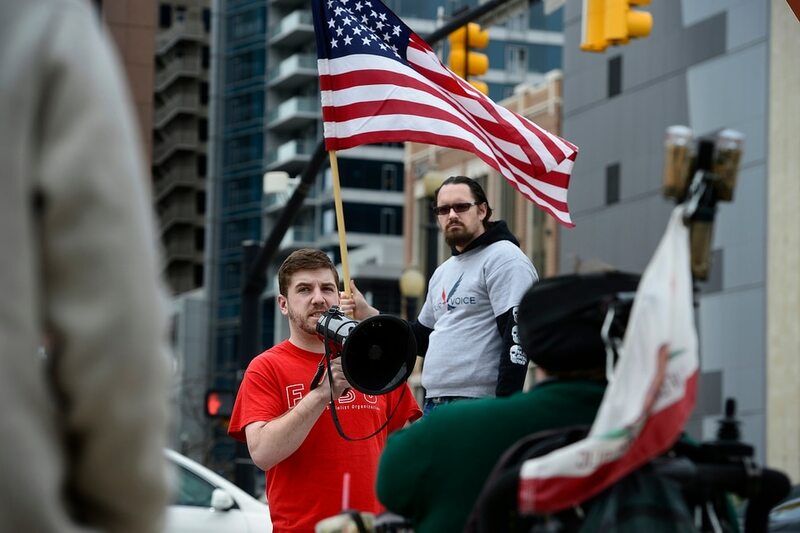 (Scott Sommerdorf | The Salt Lake Tribune) Josh Cameron speaks on the bullhorn as a group of about 40 people protested the strikes on Syria, Sunday, April 15, 2018. (Scott Sommerdorf | The Salt Lake Tribune) Bob Brister encouraged support from passing drivers as a group of about 40 people protested the strikes on Syria, Sunday, April 15, 2018. (Scott Sommerdorf | The Salt Lake Tribune) Motorcyclists tried to disrupt this protest by revving their engines as a group of about 40 people protested the strikes on Syria, Sunday, April 15, 2018. (Scott Sommerdorf | The Salt Lake Tribune) A group of about 40 people protested the strikes on Syria, Sunday, April 15, 2018. 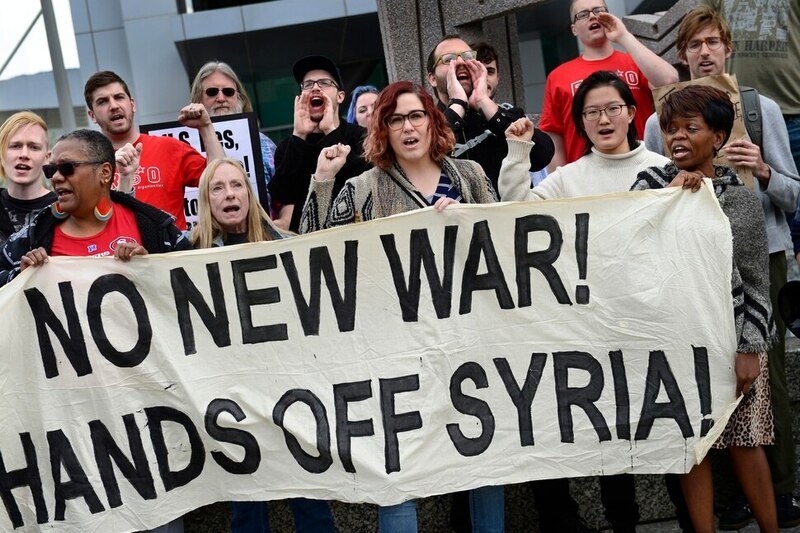 About 40 people gathered in downtown Salt Lake City on Sunday to protest Friday’s U.S.-led bombings in Syria. The rally, hosted by University of Utah Students for a Democratic Society (SDS) at the Wallace Bennett Federal Building, coincided with other demonstrations in major U.S. cities, including New York City, Atlanta, Minneapolis, Chicago, Washington D.C., Los Angeles and San Francisco. “We don’t think that escalation is in anyone’s interest,” Ian Decker, an SDS member, said, adding that the bombings could lead to war and more Americans and Syrians dying. In addition, the United States is not justified in trying to tip the balance in Syria, Decker said, and only the Syrian people have to the right to pick their leader. Gen. Joseph Dunford, chairman of the Joint Chiefs of Staff, said no additional U.S. attacks were planned at this time.